Buddies, I see from your username you own a Porsche. (JK lol) Links to yours? I like hand signals, but I am at a point in my track experience where I can go solo, but they do not allow that. Never too far away from you baby. Yep, what is funny is when I took the video I specifically took pictures of the VIN and all incase of wreck. Then BAM wrecked. I am not sure, per local social media the owner was quoted saying it would be fixed in a week. Even if you shipped it to Woking, it is not being fixed in a week. So it is hard to believe what is even being claimed through the owner. 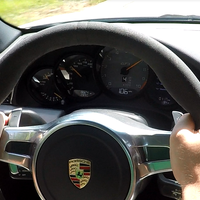 Best - Porsche 911 GT3 (991) drove it on the track at Summit Point Motorsports Park. The sounds that are heard when that engine is revved to 9000k @ 100+ mph, nothing else better. Whoa now, let us not get ahead of ourselves. Reposting 5 times is reserved for the Nobel Prize winners. Copy and paste of an instant message conversation? Pulitzer Prize. Sounds made up, but your my bro, so I will roll with it. This post was so great. I loved it. Nope I am self admitting that we are best friends. And I thought we were the best neighbors? I am starting that as well.